The Fallschirmjäger were the paratrooper (German: Fallschirmjäger) branch of the German Luftwaffe before and during World War II. They were the first German paratroopers to be committed in large-scale airborne operations and came to be known as the "green devils" by the Allied forces they fought against. The Fallschirmjäger were very effective when used in commando style raids. The Fallschirmjäger were famous for their willingness to give every effort unwaveringly even in the grimmest of situations. The Fallschirmjäger were seldom used as parachutists. Instead, they were prized for their combat abilities and frequently acted in a "fire brigade" role as roving elite infantrymen. Throughout World War II the Fallschirmjäger commander was Kurt Student. DML Dragon is a prolific model company based in Hong Kong, China. This kit comes in a shrink-wrapped end opening type box. I am no fan of this type of box, because invariably the decal sheet or parts will find their way past one of the end flaps to become lost forever. Give me an tray and lid type box andy day of the week. 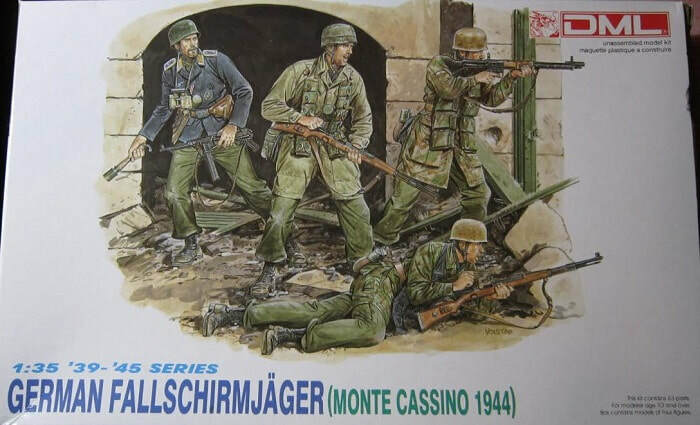 The box art shows 4 Fallshirmjagers standing rubble outside of a tunnel entrance. They all wear the Fallschirjager type steel helmets and three of them are wearing camouflaged smocks that are camouflaged. The fourth man wears a dark field-grey blouse. All wear light field grey trousers bloused into their low shoes. One man is prone and firing his 98K carbine. He has a canteen, canvas bread bag and ammo pouches on his belt. The next man, standing behind the prone man, is firing a MP44 automatic rifle. He has the ammo cases for it slung around his neck in a bandoleer in front of him. He has a canteen and canvas bread bag on his belt also. The third man to the left is standing. He is armed with a 98K carbine and has ammo pouches for it in a bandoleer draped around his kneck in front. He has a mess kit and canteen on his belt and a cammo cover on his helmet. The fourth and last man appears to maybe be an officer. He is armed with a MP40 submachine gun in his left hand and a potato masher type grenade in his right hand. He has a pair of binoculars strung around his neck in front, a pistol holster and an ammo pouch for the MP40 on his belt. One corner of the box art says that the kit is intended for modelers over the age of 10 and that it contains 63 parts. 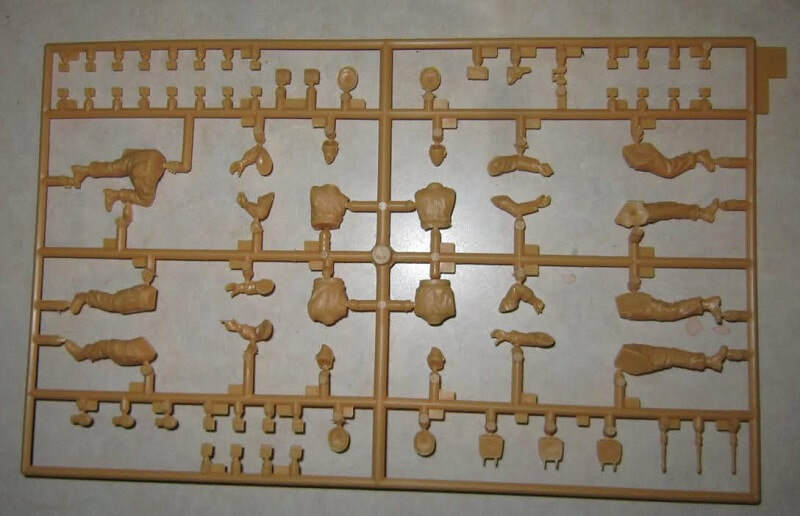 One side panel of the box says that the kit contains parts for 4 figures and that glue and paint are not included, in 6 languages including English. This is followed by Marco Polo Import, INC's street address in City of Industry, CA, who at one time was the U.S. importer and distributor of DML kits. Their FAX number is also supplied here. The copyright of the kit is 1993 and the kit was made in Hong Kong, China. The other side panel of the box has 3 color box arts of other kits that DML manufactures: kit no. 6010, U.S. Army Airborne troops (Normandy 1944), kit no. 6007, German Super Tank "Maus" and kit no. 6006, German "Cross of Iron" troops (Eastern Front 1944). ​The bottom of the box serves as both the assembly and painting instructions. 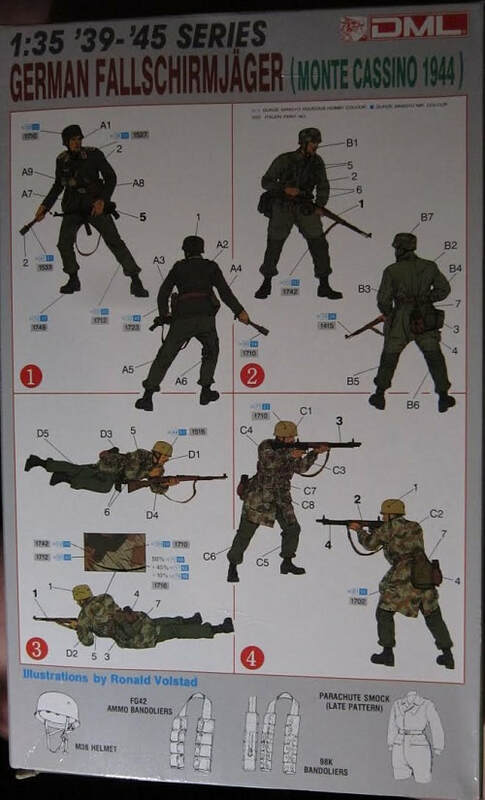 There is a color 2-view of each of the 4 figures, above black and white line drawings of a M38 Fallschirmjager's helmet, a FG42 ammo bandoleer, a 98K ammo bandoleers and a parachute smock (late pattern). All illustrations are by DML's resident artist Ronald Volstad. This kit contains a large light-tan parts tree and a small light-grey one in 2 sealed cello bags. This is a neat kit with good detail and animation of the figures. ​I purchased my kit back in the early 90's at my local hobby shop.